Originally from southcentral Pennsylvania, I spent a lot of time growing up in both Seaside Heights, New Jersey and Pa Dutch country depending on my parents' work. I have a BA in Studio Art/Art History from the University of Pittsburgh, 1986. I have had 4 solo exhibitions and participated in numerous juried and nonjuried group exhibitions since then. In 1999 I received the Judges Citation Award from WITF Gallery 33 On The Air. I took some time off to raise my family and have now restarted my career. 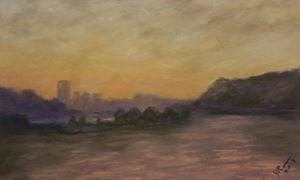 Current member of the Pittsburgh Pastel Artists League. I work primarily in oils and pastels, my secondary medium is drawing. I have other ideas in the works for experimenting with other mediums later on. My subjects include landscapes, architectural themes, animal and historical themes. My primary influences have been my mentors while in college-Paul Binai, Ken Batista, James P. Nelson, Paul Glabicki, Girts Purins, Joseph Shepler, and Phil Rostek. German Expressionism, the post-Impressionists, and Japanese woodblock prints, esp. artists like Whistler, Cezanne, Wolf Kahn, Hopper, F. Church, among others. There are some images that I have copyrighted under my maiden name of Kohr, they are not by someone else. I use color and depth of field to engage the viewer.Currently working on a series of oils & pastels exploring possibilities and uncertainties as we travel through our day to day lives as reflected in our response to our surroundings. I often include a feeling of the intangible within a place, thing, or animal. It can be beauty, awareness of past events and their effects on the community consciousness, or simply a sense of being.